Drying cannabis is a process that is followed by the harvest time. You have taken a good care for your marijuana plant so far. But even though your buds may be ready for the final process of harvesting, there is still a lot of work for you as a grower. The cannabis curing process and the drying marijuana still follow and in this article, I am about to show you the best way to dry weed. However, because the whole process can take a while, over the years growers have come up with many ways of drying until they found the fastest way to dry weed. This will speed things up for almost 50% and will shorten the entire curating and drying weed time tremendously. Before going into the whole drying cannabis process, there is the curing process which ensures your freshly harvested weed gets to the stage of its best quality. The act of curing needs you to take your buds into a controlled environment where they will be drying slowly. After that, your buds should be kept in a glass jar which will allow for their natural processes to occur over the course of several weeks. This type of drying cannabis makes it smell better, reduces harshness and helps the weed reach a better potency and longer-lasting effects overall. First and foremost, the reason why growers cure cannabis is to ensure they maximize their weed’s potency and quality. A simple explanation of just how important the curing of cannabis is is as follows: You may have started your weed growing process with some great weed genetics and you have taken good care of your weed during its entire life. Now, curing at the end is what will distinguish your buds from everyone else’s and will make the difference between “just fine” and award-winning weed. In fact, the sole reason why marijuana from any dispensary tastes and smells better than the regular one bought off the streets is that it has been properly dried and cured. This crucial process gives marijuana its smooth, pleasant taste and effect. 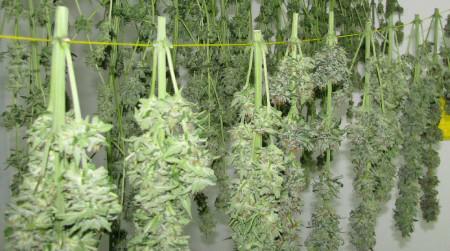 Marijuana hanging and drying via grow-marijuana. The process of curing and drying marijuana breaks down the chlorophyll in the plant. This automatically ensures that the taste of each bud is improved and the smoothness of the smoking experience and effect is increased. Is also helps remove the common smell of “cut grass” that is found on freshly harvested weed. Furthermore, the coughing effect is sizably reduced and if you are prone to weed headaches, you won’t get them as much. The chance for mold and bacterial growth is decreased largely while the potency is increased and experienced potheads will be able to tell the difference. If you are not an expert or somewhat experienced weed lover, the best way to spot the difference between properly cured and dried weed and one that hadn’t been cured is to smoke a bud that’s directly off the plant and then roll one with buds that have been properly cured and dried. The difference is huge! Even cooking with your buds, including them in recipes and drinks, or making other weed-based products at home, will be more pleasant than buds that hadn’t been dried and cured. Experts explain that this is due to the alteration of cannabinoids and terpenoids while curing. How should you be properly drying marijuana? Drying marijuana from hangers via growweedeasy. After finding out why you should be curing and drying your weed, and what are the overall benefits on that entire process, you may be wondering what is the best way to dry weed slowly? And how to dry weed at home without allowing the process to take up all your free time? While there are plenty of other ways of drying cannabis, in this article I have covered the most widely used one. 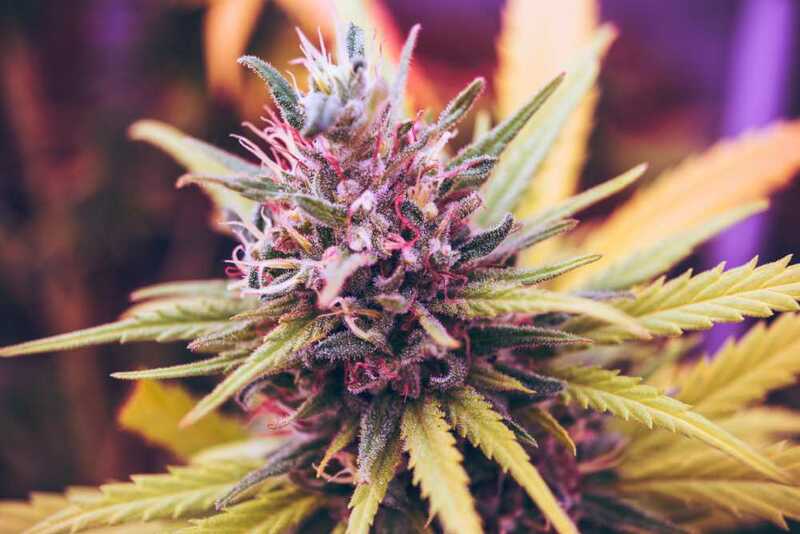 The well-studied process that has been used for many years now, and the one that many creative devoted potheads love doing because of its promising results every time, regardless if you are using an indica or sativa strain. The sole process of curing your marijuana begins when you cut down the plant after it has ripened and grown enough. This is why it’s really important to learn how to dry weed properly. Namely, during the initial drying phase, the key step is to let your weed dry out in the course of 4 to 7 days. During this relatively slow process of drying cannabis, you need to protect your plant against the growth of mold and bacteria. The reason why I say you should leave your buds to dry relatively slowly over the course of a week is that if you speed the process with some kind of heating unit, the curing will be ruined and your weed will taste terrible. Plus you will lose many benefits in the process of doing so, and if you are looking to make CBD distillate or a THC one, they won’t be as beneficial as those from a plant that had been dried properly. Marijuana plants in a room via Unsplash. In order to do this process successfully, you need to have certain tools and equipment that you will be using solely for the curing and drying marijuana. A hygrometeris a tool that lets you measure the humidity inside your mason jars. Humidipaksare packs specifically designated to store your cannabis and protect it from getting too dry and crispy while stored. The first step is to cut down your plant, obviously. You can do so by cutting the base and hanging the entire cut plant upside down to dry. You may also cut off branches individually and hang them for the drying process. Next, you should remove and trim any extra leaves. These are the big fan leaves. This step will improve the appearance of the buds overall because too much of the leafy matter will make your weed harsh. If the humidity in the room is about or just under 30% that means that the space is dry and you should leave more leaves on your plant. This will slow down the drying process and make the curing better as I have mentioned before. If the humidity is average – about 40-50% that is, then you may go on and hang your drying cannabis upside down and leave it for up to a week. 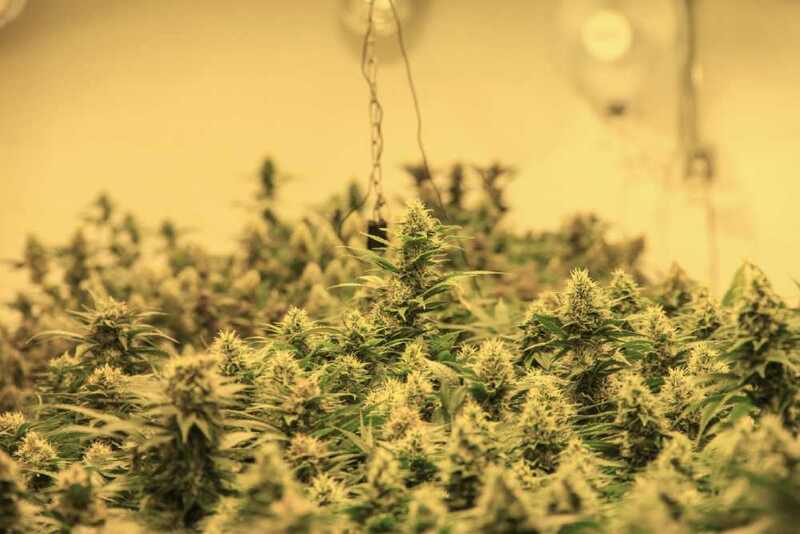 However, if the humidity is over 60%, then you should separate all the buds from the branches individually and leave enough space between them to dry. If you fail at this you might notice a really slow drying of your cannabis and mold growth. Your air conditionercools the air and dries it out too. So if you struggle with humidity and high temperatures, this is your best buddy when drying cannabis. If need lower temperature but higher humidity levels, then an evaporative cooleris what you need. This tool lowers the temperature while increasing the humidity. A dehumidifieris a tool that heats the air and lowers the humidity in general. While the humidifieralso heats the air but it raises the humidity. The heater will heat the air, increasing the overall temperature while lowering the humidity. What NOT to do when drying marijuana? The most commonly done mistakes in the drying cannabis process is when people want to speed this entire process of drying and curing. You should never quick-dry your buds in a stove or by using a dehydrator. People also do the mistake of drying weed with dry ice or even the worst of all, in a microwave. Talk about a waste of weed! This will not only create a bad taste and smell, but it will also cause you terrible migraines and paranoia when smoking the weed later on. All these processes of speeding up the drying can result in destroying certain cannabinoids and terpenes which are the valuable, healing parts of the cannabis. This can occur even at temperatures of 85°F or 30°C. PRO TIP: Using cardboard when marijuana will be of great help if you live in an overly humid environment because the cardboard material pulls out water out of the buds real quick. However, it is known to create wet spots and leave imprints on the areas where the buds have touched the flat surface. This is why experienced growers recommend rotating the buds every few hours in order for each side to get the same treatment. Using an extra fan to blow in the room the entire time is recommended for an additional airflow if you live in an overly humid environment. But keep in mind that the fan should never blow in the direction of the buds. It should be pointed to a near wall but make sure its airflow is still felt in the room.